All practicing Barristers need to be compliant with the current legislation of GDPR. Barristers are currently exposed to fines of up to £500,000, sanctions by BSB, and damage to their reputation. So, although GDPR changes the size of the fines (€20million) the compliance work should actually already be in place. If it is not, each barrister is taking serious risks with their business and the reputation of Chambers as a whole, which they need to fix immediately. Again, partaking in training implementing the correct documentation and examining areas of risk in their practice will not only reduce risk of a date breach, but will prove some elements of defence in case of an ICO investigation. 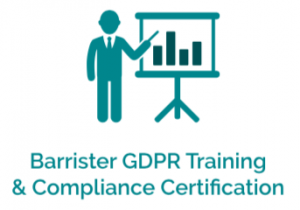 As barristers are micro businesses Briefed have been able to create a cost effective compliance bundle which barristers can complete themselves, raise compliance and achieve a Data Protection Quality Mark to proffer as evidence of data protection compliance to instructing solicitors, local authorities etc. Like the staff version, it is ordered into numerous “bite sized” chucks which means the individual does not have to sit down to do it all in one go and they can leave and re-join at any stage. Briefed will provide a nominated Chambers contact with regular updates on who has logged in and begun the course, where individuals are along the pipeline and who has successfully completed the training, making it very easy to manage from a Chambers perspective.